The prehistoric California Condor — one of the world's great birds — is back in the skies of Monterey County. Prior to the recovery project, the last wild condor in Monterey County was seen 10 Dec 1980. That was when the entire world population, centered around Mt. Pinos in southern California, was on the brink of extinction. Eventually all of the last 27 wild condors were captured in hopes of captive breeding, the final one in April 1987. The captive breeding effort was successful: the world population was over 80 birds by the time of the first releases of captive-bred condors in January 1992 at the Sespe Condor Sanctuary, Ventura County. By January 2000, there were 53 condors back in the wild and another 105 in captivity. Here in Monterey County, condors from the Sespe project began appearing by the year 2000. 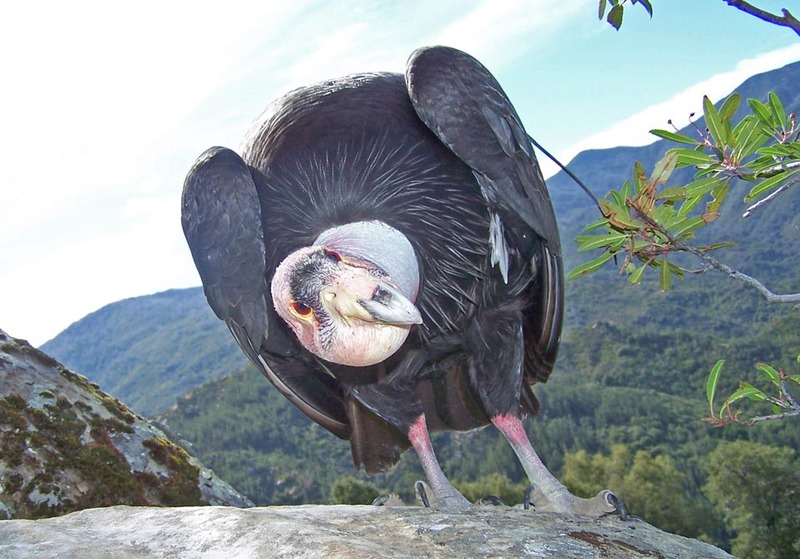 On 11 June 2000, nine Sespe condors settled on the roof of the Oliver observatory operated by the Monterey Institute for Research in Astronomy (MIRA) on Chews Ridge in the Santa Lucia Mountains. The MIRA caretaker, Ivan Eberle, took these impressive shots at MIRA during that event ... the avian equivalent, I suppose, of the discovery of a passing comet [photos above & right © Ivan Eberle, used with permission; all rights reserved]. After resting a bit they took off and flew south again, leaving Monterey County airspace within a few hours. Condors last nested in Monterey County in 1905. The Ventana Wilderness Sanctuary, a private non-profit group, began releasing captive-raised condors in January 1997. Condor pairs formed, found nest sites, laid eggs, and hatched wild young in Monterey County by 2006. The very first nest discovered in March 2007 featured the pairing of condors known as C208 (a female) and C192 (a male). Researcher Joseph Brandt managed this wonderful shot of C208 peering into the nest while Jospeh was checking the status of the egg (below © Joseph Brandt/VWS, used with permission). The nest site was in the jumbled rock face of a very remote cliff in the Ventana Wilderness (below © D. Roberson). All condors were then wing-tagged: the male of the pair, C292, is sitting near the nest in March 2007 (left © Joe Burnett). Because the interior of the cave could not be viewed from any location, VWS made 3 nest entries in 2007 to confirm the presence of an egg, and (later) to check on the health of the chick (second row below, right © Joe Burnett). Each entry required a team with helicopter and rappelling expertise (second row below, left © Joe Burnett). The chick eventually fledged in Sep 2007 but, alas, was killed later that year, probably by a Golden Eagle. Two other nests that year, though, fledged young that survived. Today, wild-hatched condors are among the cohort of condors centered on the Big Sur coast and at Pinnacles National Monument. There are nesting pairs in both populations, but birds fly from the coast to the Pinnacles, or vice versa, whenever they desire. There are ranches that provide still-born calves for condors to eat, but they also feast on dead deer and other carcasses. Lead poisoning, which comes from eating animals killed by hunters with lead shot, remains one of the biggest challenges to condor survival. On the Big Sur coast, condors have learned to follow Turkey Vultures to dine on “wild” food, including sea lion or cetacean carcasses on the Big Sur coast. The foraging on dead marine mammals is particularly poignant since the California Condor was first described to science in 1792 by George Vancouver from a condor eating a dead whale on the shores of Monterey Bay. In this photo from May 2006 (below © Ryan Choi), three condors are among the other scavengers (Turkey Vultures and Western Gull) at the carcass of a Gray Whale on a remote beach on the Big Sur coast. 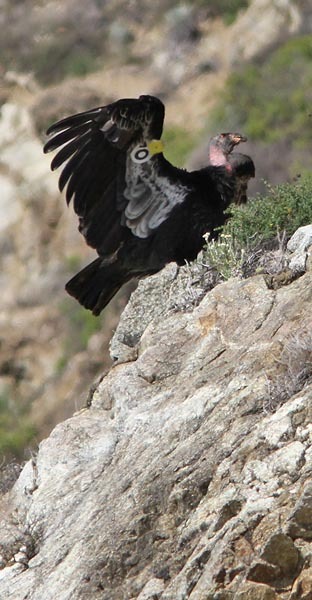 Among the full-length articles on the recovery of California Condor on the Big Sur coast is that by Roberson (2008) in Rare Birds Yearbook 2009. A number of these photos were published with that article. At about the turn of the 21st century, the United States issued a series of quarters featuring the fifty states: the California quarter was issued in 2005. The symbols chosen to represent California on the reverse side of the coin were John Muir, Yosemite Valley, and the California Condor (inset above). 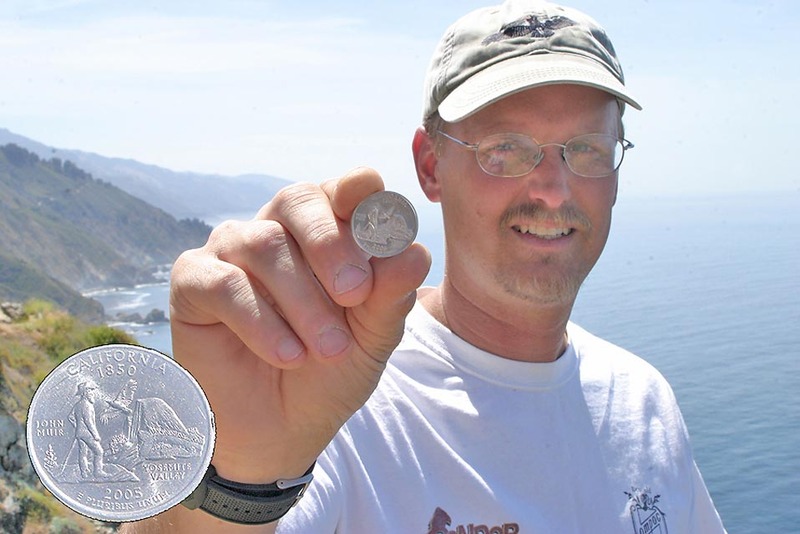 Condor researcher Joe Burnett holds that California quarter (above, photo © D. Roberson) at a favored condor site on the Big Sur coast. It is an overlook along Hwy 1 high above a rocky cove used by California Sea-lion to breed or to lounge onshore. Condors search this area for stillborn seal-lions or other carcasses, and can sometimes be found sitting on the steep cliff below the overlook. Julia Pfeiffer Burns SP is 5.1 miles south of the Big Sur Scenic Overlook, and can also be a good spot to look for condors soaring above the ridges to the east. Condors are most active on sunny days without fog, and prefer mid-day when updrafts are present. Some years ago there was a roost at Pfeiffer Big-Sur SP (which is 3 miles north of Nepenthe Restaurant), viewable from the Hwy 1 bridge over the Big Sur River (also a good spot for American Dipper). Andrew Molera SP is another 4.8 miles north of Pfeiffer Big-Sur SP, and condors sometimes fly over the ridges there, east of Hwy 1. All released condors have wing tags (MTY releases have carried white, yellow, blue, or orange tags) and each has a number on the leading edge of its wing. It is difficult to determine the color of the tag -- and particularly hard to determine the number -- unless you get very good views through a telescope or you are fairly close. Even at that, you will see only two numbers, not the three numbers used for tracking. You have to know the combination of wing tag color and the two-digit number to i.d. a particular individual. Radio-tracking is the preferred method of following condor movements; each condor carries a small antennae. In short, with condor releases having occurred for 15 years and wild breeding for more than 5 years, it is not really possible to determine which condor is which particular individual, unless you are part of the condor recovery team. You can keep up on the progress of the re-introduction of condors in Monterey County at the Ventana Wilderness Society's website. Searching for MTY condors: Highway One along the entire Big Sur coast is good from the vicinity of Bixby Bridge south to Lucia. Watch for swirling groups of Turkey Vultures — sometimes condors are with them. Sometimes condors cruise the coastline alone. Beware that vultures can look "huge" when roosting close to you [if you have any doubt you are looking at a condor, you aren't]. When a dead seal or sea lion washes ashore, condors may feed on the carcass for weeks. One such event in July 2000 was on a beach visible from dirt pull-offs on Highway 1, just a half-mile north of the entrance to Julia Pfeiffer-Burns State Park (7.1 miles south of "Nepenthe" restaurant, or a half-mile south of the paved parking lot labeled "Vista Point" that has an outline of a Gray Whale painted on the pavement). More recently, condors are most often encountered at Grimes Pt. or the "Big Sur Scenic overlook" [map above]. There are times, though, when condors soar right over Highway 1. The following two photos are of yellow-tagged #22 right over our vehicle on 18 Dec 2011 (© D. Roberson). The first California Condor known to science was described from the shores of Monterey Bay in 1792. Condors were once a regular part of the MTY avifauna. Nests were known from the interior and condors were regular along the coast into the 1900s. Jenkins (1906) reported seeing 8-10 roosting in tall redwoods along Villa Creek 18 July 1904 (on the southern Big Sur coast). Pemberton & Carriger (1915) saw a bird over Big Creek and reported that a local rancher had seen up to 10 at a carcass as late as 1910 in what is now the Los Padres NF. There are two specimens from MTY from as late as 1918 (#California Academy of Sciences, San Francisco). A few condors were regular visitors to southeastern MTY until the late 1960s; up to 18 together had been seen in Cholame Valley (Eben McMillan quoted in Roberson 1985). Even as the numbers of birds declined, MTY remained within the expected range of wandering individuals, with 13 records from 1970-1980, all apparently of adults (Roberson 1985). Seventeen Condor eggs were collected in MTY from 1859 to 12 Apr 1905, and this collecting contributed to the extirpation of the local breeding population. Nest sites were apparently in the Palisades area (now in Ft. Hunter-Liggett) and along the ridge that forms the southeastern border of the county (Wilbur 1978). Reports of MTY condor sightings from 1970-1985 that were judged “positive” by the Condor Research Center or by Roberson (1985) were: 25 Oct 1970 Cone Peak (P. Kinder), 28 Jan 1971 Pebble Beach (T. Robinson), 21 Mar 1971 Marble Peak (J. A. Rodgers), 22 May 1971 Cone Peak (P. Kinder), 28-29 Sep 1971 Cholame Valley (J. Edwards), early June 1973 Turkey Flat near Parkfield (B. Walton), 22 May 1974 Lower Arroyo Seco Cr. (M. Crutcher), 22 Aug 1974 Smith Mt. lookout, near Bradley (C. Halle), 31 Mar 1975 Hunter-Liggett (L. Sitton), 6 Sep 1977 Los Padres NF (T. Raley, seen from helicopter during Marble Cone fire! ), 31 Mar 1979 near Devils Canyon, Los Padres wilderness (R. Phillips), 2 Aug 1980 (3 adults) southeast MTY (F. Klouda) & 10 Dec 1980 Mt. Mars (J. Lopez). The Condor Research Center has on file another 9 reports between 1970-1985 evaluated "neutral" and not included here [also a 1985 report listed in Roberson (1985) should be disregarded]. 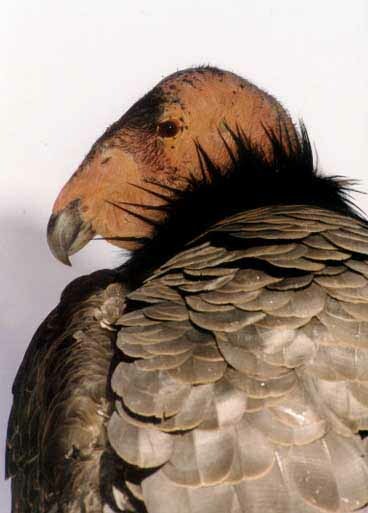 One of the original wild condors taken from the wild in the 1980s was an adult female known as "AC-8" [condor researchers have "names" for each individual condor based on their data base designations]. In April 2000, "AC-8" was released back into the wild near Mt. Pinos. Condor "AC-8" has a blue wing tag on which is the white number 12. The rest of condor cohort released with blue wing tags were young birds, so she was the only fully adult condor with a blue wing tag. In summer 2000 she was in the Sierran foothills of Tulare County to which she commuted from her winter range around the Sespe refuge. The latest rumor, though, was that "AC-8" disappeared or died in the first decade of the 21st century. The first four young condors released in January 1997 proved to be poorly adapted to the wild (one spent substantial time curiously investigating humans at Esalen) and all were returned to captivity in June. 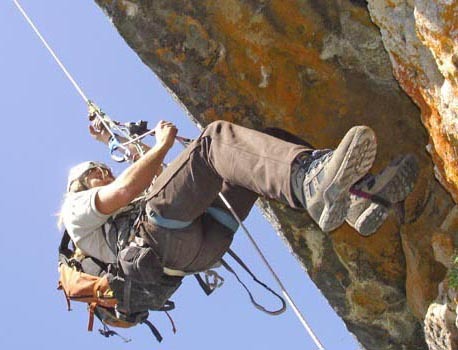 In December 1997 five different youngsters were released from their hack site high above Big Sur in the Ventana Wilderness. Unlike the first set, these had been reared by adult condors early in their life and were less imprinted on people. Additional releases since then, including six on 4 Mar 2000, brought the local population to 15 birds at that time. Ventana Wilderness condors have flown 150 miles south to mingle with condors released in the Sespe area. They also regularly mingle with condors in Pinnacles National Monument. The first wild nests from the recovery project were in 2007. Three eggs were laid in 3 nests, and all 3 youngsters fledged, but one was killed, likely by a Golden Eagle, during its first winter. The "countability" of MTY condors: From a bird-lister’s standpoint, the captive-bred released birds in the late 1990s and early 2000s were not “countable” condors. Captive-raised birds are not "countable" under the American Birding Association (ABA) rules, even those released back into the wild. 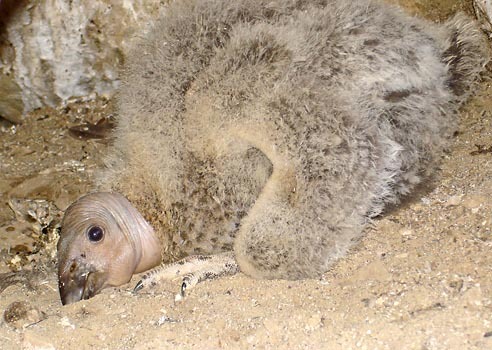 However, this changed with the fledging of wild young from wild nests within the Condor's native range. Local observers long ago agreed that wild-hatched birds would be "countable" on all lists. Now, in 2012, and some five years since wild-hatched condors were fledged, it is not possible to distinguish the wild-raised birds from zoo-raised birds. The tag numbers for the wild-raised birds were not widely disseminated and, in any event, it can be very difficult to 'read' a tag, which requires both the number and color on the tag, and then access to the stud-book. Both Bald Eagles and Peregrine Falcons were re-introduced to the central California coast during the 1970s–1990s, and both the eagle and falcon have fledged wild young from local nests annually. No one has raised any concern about the "countability" of any eagle or peregrine, and it has become impossible to know which ones were released birds and which are not. The situation with California Condor is now the same. We welcome all birders to "count" California Condors on their life lists, state lists, county lists, year lists, yard lists .... er, well, you should be so lucky . . . . .
With 'countability' issues out of the way, it is sometimes possible to determine exactly which condor you have seen. 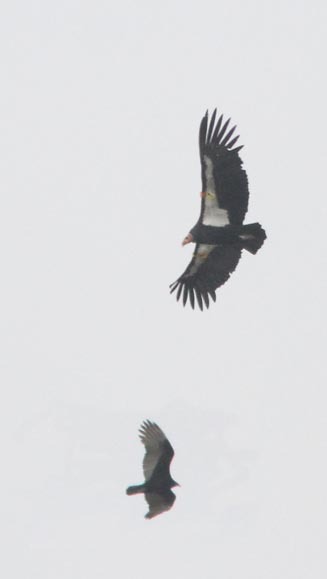 Condors still do have radio transmittors (see the antennae sticking out of the back of the adult, above [25 Feb 2012 © D. Roberson]) and still do have wing tags. 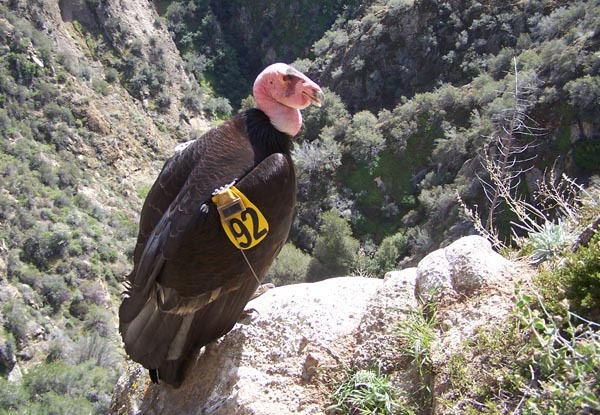 With combination of tag color and number, one can determine the three-digit condor number, and then check out VWS website biographies of the Big Sur released or hatched condors. For example, yellow-tagged adult condor "04" (above) is named "Amigo," and the combination of color and number makes it #204. He is an adult male hatched in 1999 at the San Diego Zoo. After release and becoming an adult, he paired in the wild with a female named "Cosmo". But in 2010 Amigo was found badly injured and was taken back into captivity to be nursed back to health. By time time Amigo was released again, Cosmo was paired with another male. Now, in 2012, Amigo has lost his territory but has become of the foster parent to young condor "Fuego," white-tagged #70 (left), whose full number is #470. 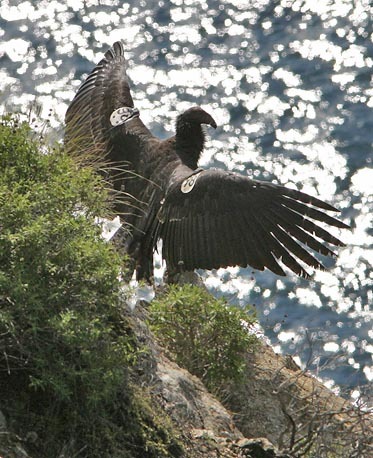 Fuego is a wild-fledged condor that survived the 2010 Basin Fire that swept over the VWS release site and came very close to Fuego's cave. When these photos were takin in Feb 2012, the two (Amigo and Fuego) were always seen together, both in flight and, when Amigo landed, so did Fuego, who then scrambled up the steep cliff to join his foster parent. At the same time, though, a third condor was watched in flight, bearing white tage "38." We ran into Tim Huntington, a local condor-watcher and wildlife photographer, who explained this condor was a visitor from the Pinnacles flock. 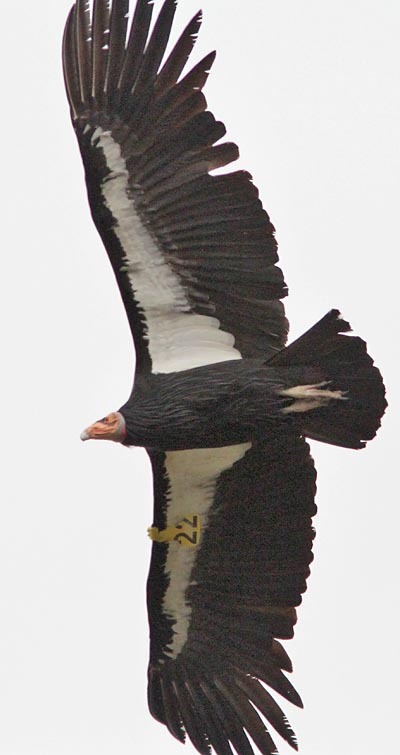 The "Condor Spotter" website also identifies this adult female is one types in "38" and chooses "white tag." Of course, one must be able to determine both the wing tag and color to use these resources. 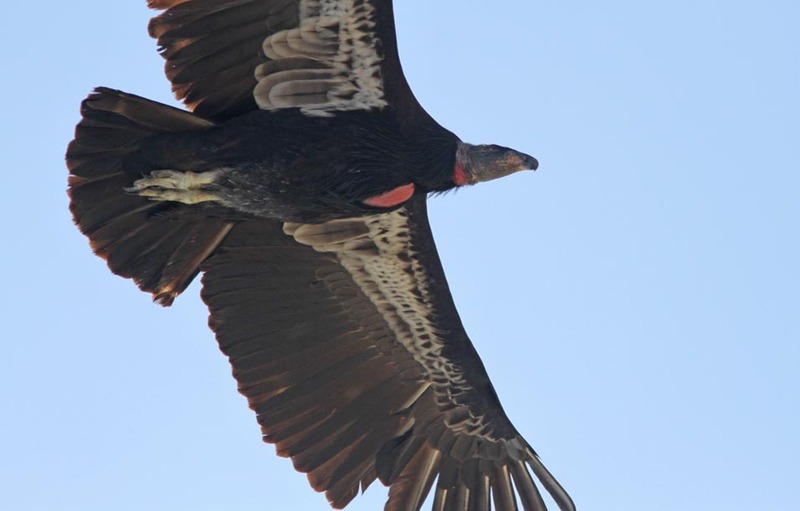 It is also wise to keep in mind that there is interchange between the Big Sur and the Pinnacles condors, as well as visits from southern California birds. Still, it is a great time to be enjoying the California Condors in Monterey County (young Fuego, overhead, below © D. Roberson). Jenkins, H. L. 1906. A list of birds collected between Monterey and San Simeon in the coast range of Calif. Condor 8: 122-130. Pemberton, J. R., and H. W. Carriger. 1915. A partial list of the summer resident land birds of Monterey County. Condor 17: 189-201. Roberson, D. 1985. Monterey Birds. Monterey Peninsula Audubon Soc., Carmel, CA. Roberson, D. 2008. "California Condor: Ice age icon adapts to the modern world," pp. 28-35 in Rare Birds Yearbook 2009: the World's 190 Most Threatened Birds (Erik Hirschfeld, ed.). Birdlife International, Shrewsbury, U.K.
Wilbur, S. R. 1978. The California Condor 1966-76: A Look at its Past and Future. North America Fauna 72. U. S. Fish & Wildlife Serv., Washington, D.C.